The Stanley Cup Summer Victory Tour landed in Stockholm, Sweden recently, where Chicago Blackhawks defenseman Johnny Oduya, center Marcus Kruger and left wing Viktor Stalberg (now with the Nashville Predators) showed off the oldest trophy competed for in North America to family, friends, and fellow countrymen of the hockey-crazed nation. Rather than follow in the footsteps of other players who’ve water-skied with the Cup or allowed their pets or children to eat out of the iconic trophy, Oduya had it as the guest of honor at a dignified, formal sit-down affair with a group of life-long friends and hockey buddies. 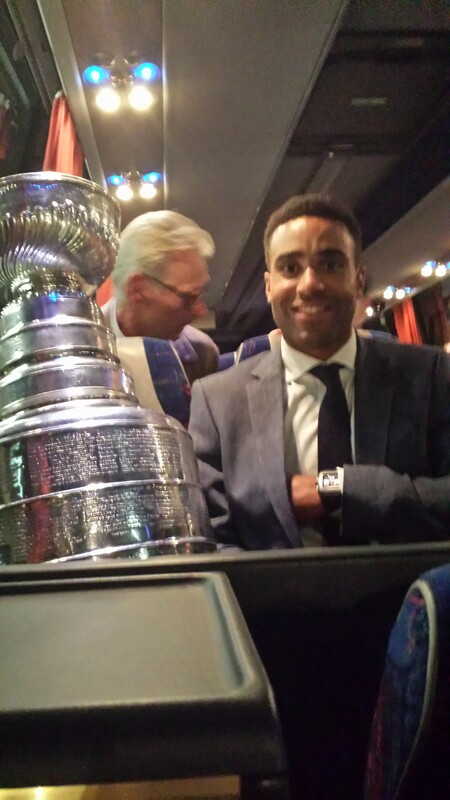 Oduya shares a bus ride with Lord Stanley in Sweden. (Phil Pritchard, HHOF). Kruger, meanwhile, had a party with the Cup at The Soap Bar in Stockholm and Oduya stopped by for the festivities. Stalberg, a free agent signed by the Predators, took Lord Stanley on a first-ever visit to Gothenburg, Sweden. Oduya was traded to the Blackhawks from the Winnipeg Jets during the 2011-12 season for a second and a third round pick in the 2013 NHL draft. The trade paid dividends for Chicago last season as Oduya registered six goals and 14 assists and was a steady plus-12 in 48 regular season games. He notched 3 goals and five assists and was a plus-12 in 23 playoff games. He scored a goal in the third period of Game 1 of the Stanley Cup Final against the Boston Bruins that sent the match to overtime. The Blackhawks eventually won that game 4-3 in a triple-overtime thriller.